Adelaide outdoor living – let’s BBQ! It’s great to see a reality TV show that Outside Concepts can really embrace; a show that highlights the mouth-watering flavours you can create with a good BBQ, a pair of tongs and a great Adelaide outdoor living area! All jokes aside, Aussie BBQ Heroes on Channel 7 is great inspiration for anyone who’d rather get outside and into their Adelaide outdoor living area to create a feast rather than slaving away in a hot kitchen. And what better time to take up the challenge than with summer and Christmas just around the corner. Corn, avocado, zuchuni, pineapple, mushrooms, capsicum and other fruit and vegetables. If you’ve never tried banana, split open and filled with chocolate and then cooked in aluminium foil on a bbq you’ve never lived! Potatoes – strictly speaking a vegetable but when combined in foil with butter, rosemary, garlic and other beautiful flavours the humble spud is humble no more. Seafood – fish, prawns, muscles and more. 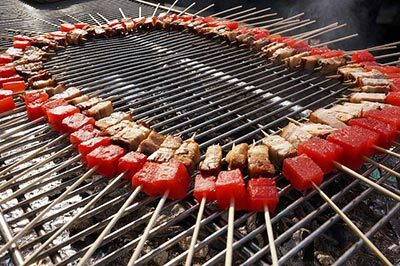 Really, if it can be grilled, baked or cooked inside, with a bit of imagination and the right equipment it can also be barbecued outside. So get outside into your Adelaide outdoor living area today and see what you can create on your bbq. You might even end up on TV! Check out our Outdoor Kitchen Melbourne page.